Back in the late 1980s, a series of pocket books appeared introducing English speakers to several writers who would become lumped together as post-modernist or post-structuralist philosophers. At the time, though, the names of Baudrillard, Lyotard, Virilio and Deleuze & Guattari were a lot less well known and these pocket books (dubbed the Foreign Agent Series) had the aura of underground publications. More aptly, perhaps, they seemed extra-academic; they didn’t seem to be coming from an institution and least of all from a British institution. The origins of these books, however, lay in a series of Journals and Conferences organized and edited under the name of Semiotext(e) and which came out of a specific department of Columbia University (an institutional vacuole?). One such Conference and accompanying Journal was the Schizo Culture gathering of November 1975, which brought (mainly untranslated) French theorists into collision and collaboration with elements of the SoHo Art Scene and with anti-psychiatry and prison activists like Howie Harp (Insane Liberation Front) and Judy Clark (Midnight Special). Ever mobile and shape-shifting and apposite to Semiotext(e)’s birth in a critique of linguistics1 we would find that William Burroughs (he of the ‘word virus’) was present, as was his fleetingly one-time Project Sigma collaborant, Ronald Laing. With this publication then, we get an elegant and pricey box set containing a re-print of the wide ranging and visually ‘jarring’ Schizo Culture Journal along with a companion book gathering together some of the papers that were read at the Conference as well as a smattering of transcribed talks and discussions. Both of these volumes are introduced by Semiotext(e)’s Sylvère Lotringer through which we garner a sense of the sapiosexual excitement, logistical chaos, mutual suspicion and leftist conspiracy theory that all get their place as situating factors that feed into the remembered atmosphere around the Conference. As the original flyer states, the Conference was at pains to act as a conjunction point between the “revolution in desire” that came into focus after May 1968 and what Burroughs, speaking of the late ’60s and early ’70s, called the “cultural revolution of unprecedented dimension”. It’s also made clear that the “schizo” of the title did not refer to “any clinical entity, but to the process by which social controls of all kinds, endlessly re-imposed by Capitalism, are broken up and opened to revolutionary change.” There is then a pronounced influence upon the conference coming from Deleuze & Guattari’s Anti-Oedipus (which was also the theme of a Semiotext(e) Journal in 1977) as well as something of an expanded view of capitalist power relations as insidiously endocolonial and woven into the very fabric of institutions and their surrogate imposition of self-definitions. If Laing points here towards a form of schizo culture that takes in a breadth of expression that, in forging links between people rather than the ideas they carry, could forge new forms of social relations, then it is as well to drift outside the Schizo Culture conference to both recall and discover collective initiatives such as Mental Patients Unions and anti-psychiatry collectives2. Across these two books there is, then, reference to Howie Harp’s Mental Patient Liberation Project which set up a store front project in New York; there is the inclusion of The Boston Declaration on Psychiatric Oppression; a flyer from the Network Against Psychiatric Assault announcing a conference on ‘Social Rupture and/or Social Control’; and an intriguing article documenting the institutional self critique of psychoanalysts working at the Lavans Hospital by François Peraldi (who went on to edit Semiotext(e)’s Polysexuality issue). Of the initiatives outlying the Schizo Culture conference we see, in the persons of Foucault and Deleuze, that the Group of Information on Prisons was represented as well as, with Guattari in attendance and David Cooper contributing a piece on ‘Non-Psychiatry’, the International Network for Alternatives to Psychiatry. I mention these, albeit local and Western initiatives, as I think they lend both components of this publication an atmosphere of activist engagement and urgency. The Schizo Culture gathering does not seem to have been a somnolent procession of paper-reading Phd point grabbers (however, having said that, Felix Guattari’s suggestion to move further away from an academic format, Lotringer reports, was met by some attendees with dissension!). Yet, in another direction, the direction of ‘molecular revolution’, these initiatives could also be said to reflect what Henry Louis Gates Jr. called “politicizing the political”3, for, outside of the categories of politics proper and its misguided search for the ‘revolutionary subject’, what we have here – with a concern for the inmates of Asylums and Prisons, with methods of control being revealed to operate at both an institutional and intimate level, at the level of procedural command and speech codes – is not just the growing absence of a wholesome and authenticatable subject, but subjects (stripped of ‘rights’) that are excluded to the degree of being prevented from accessing their own lived historicity and means of expression. 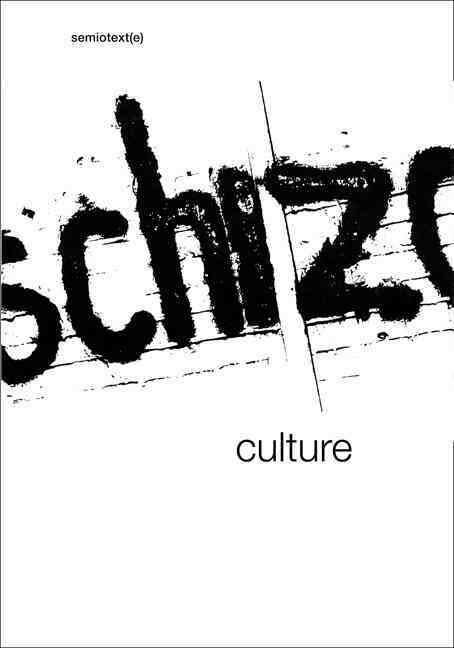 In this light, the Schizo Culture project, wary of what Guattari calls “semiotic subjugation” and what Burroughs has referred to as “word authority”, seems to attend to both a liberation of the means of expression associated with the unblocking of madness, (c.f. the “psychotic phonetics” of Louis Wolfson and the role in the conference of the counter-discursivity of music and theatre) as well as to a cautionary shedding light on the way that this semiotic subjugation can come, with tight definitional meanings and an individualising response to our enunications, to infect the groups to which we belong. Lyotard’s contribution (one which we are informed was met with a lack of enthusiasm from a Foucault and a Guattari at the back), takes this up through his discussion of ‘magisterial discourse’: “the discourse concerning that which authorizes one to say what one says.” For Lyotard such a meta-discourse and its sovereignly legitimation is often kept hidden and one could offer that it is just such a meta-discourse, the power of language and the taking of power from the high chair, that is undermined and unsettled by what David Cooper called the ‘language of madness’. However, it is often the identification of these meta-discourses (be they patriarchal right or white rites or class fight or bureaucratic wheelwrights) that, in revealing relations of power, can get you labeled as ‘mad’ in the first place. Lyotard’s essay in the Journal is called ‘On The Strength of the Weak’ and, in however oblique a fashion, he points towards this power of the weak to expose the meta-discursive or, in more common parlance, the unspoken rules by which our communications can be confined and monitored. None feel this more than the sectioned and the sent-down and none feel more keenly the repercussions from the powers-that-be (the powers for whom state legislation is the bank of last resort). As with the ban on literacy for Black slaves in the Southern States, so these inmates, similarly deposed from human-feeling and denied cognitive abilities, only need argue back against their diagnosis and captivity to be seen as posing a threat to the meta-discursivity of identificatory power relations that ‘absolve’ the powers-that-be (hence the random sadistic violence towards slaves in the Southern States and the continual litany of multi-institutional abuse). For Lyotard this ‘strength of the weak’ is directed towards exposing the pedagogical legitimation of the powers-that-be, but whilst such a pedagogical control is undoubted, the inclusion of advertisements for pharmaceutical drugs and ECT and surveillance machines in the Schizo Culture Journal cast a mournful shadow over the potentialities of a strength – separated-out by diagnostic caveats – that lacks ‘force’. Maybe Lyotard is caught in his own meta-discourse (that of Philosophy) as the transcription of his session at the Conference records one member of the audience as saying “Could you give some examples of what kind of actions could be used in a practical way [so as] to turn the discourse against itself.” The Emperor’s new clothes? So, when one turns to David Cooper’s contribution to the Journal one can read, in a passage descriptive of his hopes for the International Network for Alternatives to Psychiatry, how the strength of the weak can be made powerful: “… through a form of meeting, the person can see how repression is concretely mediated to him or her by the institutions in which his existence is embedded. People thus re-appropriate the power [they] invested in the abstract system and growing potent they see the impotence of the system.” Perhaps the Schizo Culture conference figured (or could have figured) as an impromptu meeting of the Network which held several, not unrelated, conferences from the mid 70s4. Whether or not that could be the case is maybe just to make my own fantasy links (as would be the desire to see Franz Fanon and Hussein Bulhan there), when it’s probably more discursively correct (!) to suggest that the conference, as with much of the publishing activity of Semiotext(e), was important to many in that it pronounced in favour of ‘new schemas of politicisation’. Maybe, as with the Polysexuality anthology (also reissued), it is the case that the inclusion of the ‘psyche’ in politics – the inclusion of myth, ritual, projection, introjection, social fantasies, group dynamics, imaginaryness etc. – can only come, at present and before the arousal of ‘abreaction associations’, through a practice of culture, living culture, de-institutionalised culture, de-egoic culture, schizo-culture … that precipitates, as Fanon suggested, an occult instability. 1 Guattari described his own similar project as “corroding the linguistic edifice from within”. See The Machinic Unconscious, Semiotext(e), 2011. 3 Henry Louis Gates Jnr: Tradition and the Black Atlantic – Critical Theory in the African Diaspora, Basic Civitas Books, 2010. 4 As with Frantz Fanon’s clinical work at Blida-Joinville, there is minimal information available about this Network. Aside from Cooper and Guattari, others involved, as far as I can find out, include Franco Basaglia (Italy), Maria Langer (Argentina), Monny Elkaïm (Belgium), Robert Castel (France), Yves-Luc Conreur (Belgium), Anne Lovell (USA).